How do you measure the success of your safety process? Do you use lagging indicators such as incident, frequency and severity rates to measure injuries? Do you track your workers compensation cost? If metrics show improvement or meet your industry standard do you feel you are successful? While lagging indicators are important, the true measure of operating excellence is how all employees, from senior management to hourly, approach and do work. Operating excellence is enhanced by their capability (skill and knowledge) to use safety systems. One of the most powerful tools available can be found in "Safe Operations". It engages all levels of operations with an understanding of risk and how it can be reduced or avoided. Most training programs are led by supervisors or experienced employees who provide important information on how to do a job and hopefully how to do it safely. In many cases the employees are not active participants in the program and does not have an understanding of the process. "Safe Operations" engages everyone in this process that ultimately provides a safer workplace. 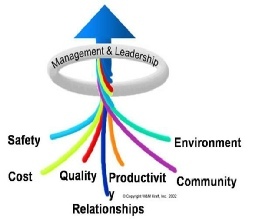 "Integrating safety, cost, productivity, quality, environment, relationships, etc. into everything we do ...how we approach and do work…….accomplishing zero harm, operations, cost, productivity and relationship objectives"
"Managing risk (recognizing hazards, assessing risk, reducing/managing risk and assurance) so no injuries to employees or property damage, environmental impact or community harm occur while doing work"
"Not accepting abnormal or unacceptable operations as the norm – with understanding that undesirable operations occur because of a number of factors, such as human, economic, weather, equipment, etc. – and addressing the undesirable operation with a sense of urgency through accepting accountability"
"Leadership that delivers vision, goals, accountability and motivation with passion, will, energy, and caring in such a way individuals positively respond to the direction while achieving peak performance." Contact Terry Rife or Will Kraft for additional information and success stories of companies Will has helped. It is a model that works! !